The Torres del Sol apartments are located in Los Cristianos, just next to the new beach, Playa de las Vistas. There are numerous bars and restaurants along the promenade, serving a wide range of cuisines including Spanish, Chinese and English. On site facilities include a swimming pool, plus a childrens' pool with safety barrier, supermarket (which is open till late), pool bar and small restaurant, a 24-hour reception, plus a laundry service. There are amazing shopping complexes in the surrounding area. The facilities available on the beach include water sports and plenty of sun loungers (paid for locally). 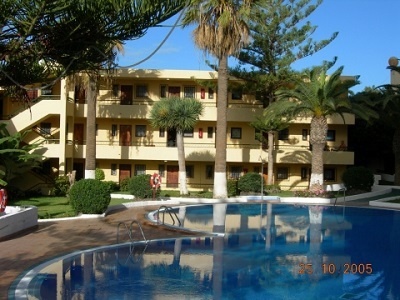 The apartments are perfectly situated between Los Cristianos and Playa de las Americas. It is possible to walk along the promenade in either direction. One way you reach Playa de las Americas, where all the posh 5-star hotels are situated, such as the Mare Nostrum Resort. There is also a fantastic shopping centre, Zone Zentral where you will find the musical fountain display each evening at around 9pm. There are also numerous bars and restaurants including a very well recommended Chinese and Japanese restaurant, Tepanayaki. In the other direction you walk past more bars and restaurants towards the centre of Los Cristianos.